Hi Anthony, thanks so much for agreeing to this interview. I am really looking forward to talking to you about the new release but first can you tell me a little more about yourself? What prompted you to decide to evolve from a successful independent bottler of 8 years to building and owning your own Distillery? It was really down to the sudden surge in interest for malt whisky in general that and the fact it was becoming increasing difficult to source good quality single casks as an independent bottler. It seemed like a natural progression, if I couldn’t source good quality whisky, then I should make it myself and the timing was just right, although it was a big leap of faith. I think if you do all the sums you would never be brave enough or stupid enough to take the risk and do it. Why did you chose Islay? Islay already had the iconic status among the whisky world and the seven distilleries that were already there were all owned by big companies. Islay had a great reputation as a single malt brand and that has really helped sell Islay whisky across it the world. The location is very important when it comes to building a distillery. The strong Islay flavours have really helped all Islay malt become better known around the world and people are now drawn towards those strong, distinctive flavours and characteristics that used to put some people off. North America and Europe are big markets for the Islay flavours, although that said, the whole world hasn’t been won over yet! We are yet to appeal to Asia and convince them to try and enjoy the stronger flavours that Islay brings. What was the biggest challenge you faced in building the distillery? Funding is the hardest challenge anyone has, it was all down to the funding and having the cash to see us through. It took four years to raise the first £1m and I knew that wouldn’t be enough. We were lucky to have some private shareholders come on board who were gave us lots of support and financial backing. This was important as I decided not to produce a gin but to release younger whisky instead. Gin has really exploded and for distilleries is often a consideration as there is such a quick turnaround, the worry is with so many gins now on the market how can they all survive. For me whisky was always much more important to me and I wanted to concentrate on that. Are the Shareholders happy to leave the running of the distillery to you? The shareholders are very happy now to just let me get on with it as the business is going really well. The success speaks for itself and I have proved that it is a viable distillery with a great product. I made mistakes during the build project along the way and the shareholders were more involved then, but over time their confidence has grown alongside mine. You run business along with your sons and wife, was including your sons always important to you? Not at the start as I didn’t know how it would go and how the business would grow. For the boys to come on board they needed to have the same sort of passion and drive that I had. It was important to me that they could really believe in what we were achieving. I never pressured them into joining the business, but as they were fairly young when I started they’ve always known what the distillery life is like, and how hard we worked to get up and running and make a success of it. They’ve been involved from the start through me and know just what the business has meant to us all as a family. It also has the advantage that I get to make the majority of the whisky cask decisions and stay in the distillery and the boys now work more as brand ambassadors and taking care of the sales and marketing roles, and I think they are happy with that and they enjoy travelling the world. I used to have to carry that work out, so I’m lucky to have a team I can trust to take over that role for me. Are there ever any downsides to the business run by the family? There are challenges to seeing anyone 24/7. Certainly in the beginning for my wife and I, there were money worries at the start which made life harder, but you need to take the rough with the smooth, and that makes you appreciate the good times so much more, and keeps you focused and hard working. Kilchoman is a working farm distillery, what effect does this have on the distillery? All whisky production started with small farms from the very beginning, having a working farm is an important part of the tradition of both Scotland and whisky and that’s something that was really important to us to incorporate. It made great business sense as well, we could grow, produce and malt some of barley we needed and it sets us apart from everyone else here on Islay. People coming to Islay went to their favourite two or three distilleries, and at the start people didn’t know about us so we didn’t feature on their radar, having the farm makes us different and brings a different distillery experience. Having the café also helps with the overall experience. You don’t come to visit us and take a seat in an auditorium, we don’t have videos or gadgets, and here at Kilchoman you can really feel a part of the distillery and of the history of whisky. Of overriding importance to us is that we can tell a different story. Although our production is increasing we won’t ever just mass produce. The smaller distilleries were disappearing and we are now the only private company, and I think people like that about us. There is a place for everyone and without the large companies we certainly wouldn’t be where we are now. How involved are you with the Distillery on a daily basis? Entirely involved, when we started up I had to try and run the distillery and do a huge amount of travelling to get our name and our product out there until my sons came on board. Now that they have taken that on I am always at the distillery aside from a little travel here and there. I take care of all the releases, I plan the sales, I manage the stocks and decided what limited releases we put out. I do select the casks with John and Tony for what will be in the current vatting. I also do all the purchasing and make a huge amount of company decisions. We have visitors from all over the world come to us now. Quite often our distributors will bring people over and I’ll give them a tour and a tasting. Or I might be selecting casks for vatting in particular for Machir Bay which is very popular. I need to find the best casks and keep a constant eye on stock. If I needed to I could do the distillation itself as I have learnt so much over the years on the job. For me cask selection has always been something I have had an interest in and good knowledge of. The key to a successful distillery is good quality spirit, and a good quality cask, if you have these two things and a good team around you then you can make a good quality product. I am lucky to have a great team around me which adds to our success. It’s great to see a release hit and watch all the positive comments come in. It’s very rewarding to see a product you have put your heart and soul into hit the market and be well received. Full maturation is important to me rather than just a finish on a whisky. There are so many companies that put many different styles out, some well and some not so well but I’ll leave that to them. When we have committed to our choice and watched it grow over the three plus years, bottled and released it, so to know that we got it right is hugely rewarding. What’s your proudest whisky achievement to date? The quality of the spirit itself. This made our job so much easier, we have achieved such a distinctive character of spirit right from the start it was easy to transform this into whisky over a short period of time. We’ve not changed this spirit from day one and it’s always worked. Selecting casks can be more difficult but by putting good quality spirit into good quality wood you get good quality whisky. I can pick up 25 casks and the quality is so consistent there is little variation. We really take our time selecting the best casks, a lot of the quality of the whisky comes from the wood. In the past the industry maybe weren’t as aware of the influence of the wood and older, lesser quality casks were sometimes used which had a direct effect on the end product. The industry is far more aware of the importance the quality of the cask makes. What do you when you aren’t working? I fish, and I play golf (not very well) and I do enjoy watching sport, but I prefer to be outdoors. It’s hard to relax as I like to be in constant touch with the distillery and that’s important to me, I can deal with queries or problems wherever I am. Kilchoman started out by releasing NAS whisky before also releasing Vintages, are there any plans in the pipeline to release a standard aged release as part of an ongoing core range? We don’t have any plans for that at the moment but we may do. I am very open minded and we just want to concentrate on building the brand and the quality of the product. We don’t want to be pigeon holed by age statements, we have Machir Bay which is our core expression and this will probably never be a specific age release, however we may release a little more information on the bottle to give people the chance to work out the ages more and it gets older every year, but we don’t get too hung up on the age. I may be persuaded to change my mind but I really don’t want to do down the 12, 15, 18 route as so many other distilleries are doing this. There is great debate at the moment about whether NAS whisky is bad or good for the industry, what are your thoughts on this? If it’s a distillery or brand that has always released and marketed age statement whiskies you know what you are getting, so when that brand, say a Macallan changes its range and that range doesn’t say age any more you are wondering what you are getting. The industry survived and traded on the age of whisky for so long, it was always at least 10 years old, and it’s harder for bigger, companies to now switch. NAS are good for companies that have always released at least one NAS expression, I think that NAS is good for the industry itself, and in some cases is necessary. One of the biggest bones of contention with NAS appears to be the price, it is thought by some that the price of NAS is too high compared to age statement whisky, what are your thoughts on that? This could be because we are so used to paying for the age of a whisky. It’s time to think more about the price of the product and what it’s worth to you as the consumer. Have you faced any difficulties with release NAS Whisky? We were lucky our whisky was good enough at three years old to bottle and sell. We were worried people wouldn’t try it and just dismiss it just as firewater but the whisky surge came at just the right time. The industry is developing and consumers and whisky people know so much more and are more open minded. The latest release is the Port Cask Matured release, why did Kilchoman decide to fully mature a whisky in Port Pipes? Because I didn’t just want to do a finish, I never do. I want something that will work for a full maturation, and it’s brought a great balance. I don’t do this for marketing, it’s not a gimmick and never will be but it’s worked really well and I love the product. We’ve tried full maturation before, experimenting with other types casks, and not enjoyed it but this worked really well. The colour and flavour profile is just right. We won’t do another port cask release for another four or five years but that’s not to say we won’t ever again. We like to do something different, we want to constantly change and evolve, and it’s worked so well for our product. Although it’s not officially been released you did have some stock at the Edinburgh Whisky Fringe. Everything that has been tried at festivals so far has been cask samples in quite limited stock, it was good to get an idea of the reaction to this whisky, but it hadn’t yet been vatted. In fact James tells me you have the first vatted sample of the Port Cask Matured to leave the distillery for review. I chatted about it with Jim Swan and we discussed a couple of options but he already had a contact with regards to ruby port and he really thought it would work well. He knew I was interested in trying something a little different and we filled Madeira, Port and Sauternes back in 2010, we tried them and the port was the stand out product. When is the official release date for the Port Cask Matured Release? We will start bottling on the 1st September with bottles released from the 8th September. Is it important to Kilchoman to try different full maturation, and do you feel that as the whisky is NAS this gives the Distillery the opportunity to be more experimental? We stick mainly to bourbon and sherry maturations and the sherry has always worked very well. I like a sherry influence but I don’t want it to become too overpowering. I will experiment a little but not too much. Jim Swan loved the spirt right from the start and said if we look after it well then it will be great in three. Years, which was fantastic to hear. We also have to use the right casks as I mentioned and all of our first fill bourbon casks are from Buffalo Trace and that is a fantastic cask for us and superb quality so we won’t change it and as the quality is so good and the spirit spends a shorter amount of time in it we can achieve more refills as well. So, tell us about the spirit itself, what flavour profile would you say is typical of Kilchoman? It has a clean character, no off notes, no feints just sweet citrus and lemon notes on the nose, and on the palate there is the peat and the distinctive Islay character. It’s quite a gentle peat, there is nothing too hard hitting or harsh. The sweetness in the spirit has allowed us to use it young and it’s helped the brand. How did you achieve such a good spirit from the start? I had a lot of good advice, and I already knew what I wanted. I knew that I needed to release it young in order for the distillery to survive. We use great ingredients and our still size has a huge influence on the flavour and quality of the spirit. We have smaller stills so we have lots of copper to spirit surface area making the spirit sweeter. There are rumours that some distilleries are having problems with stock levels (perhaps prompting the increase in NAS releases), how are you coping with the demand for your whisky? Do you have stock laid down to release a 10 year old etc? I think that companies that have released age statements are suddenly finding themselves with less stock and maybe now have to considering releasing a non-age statement product. As we don’t currently intend on ever releasing an age statement, we don’t have to worry about that. I always have an eye on our stock levels. Kilchoman are very proactive at festivals and events and really engage with their fans on social media too, is this important to the Distillery? The reach of social media is doing amazing things within the world of whisky and is a massive part of the world and the industry. Whisky is what we do and what we love, we are grateful for our fans and know that we have some huge enthusiasts and that to them it’s like being part of an extended family. It’s great to speak to people who love our whisky and to educate people who aren’t yet familiar with us. Festivals bring people that maybe wouldn’t try our product otherwise, and we know how important it is to spread the word. We need to sell our product and festivals and traveling is necessary and important in that respect. The industry is changing, there are bloggers and whisky writers out there who lots of people listen to, which I think is a good thing. People are so well educated and they almost become ambassadors of the brand and they sell it for us. Social media makes such a difference and for a company like us and with younger sons that were already into social media this helps massively. I personally am not of the generation that gets involved with that, the boys are convinced I’m a dinosaur. We are huge fans of Kilchoman and Stewart is a keen collector (it’s terrible having so many bottles of Kilchoman around me that I know I can’t open), what are your views on whisky collectors? I think that we understand that the collector market is growing much like wine, and it’s becoming, or can become an investment, although you have to really know your stuff or take a chance. A successful distillery is based on sales, if we sold only to collectors we wouldn’t be in business, but they have their place. It’s the drinkers that we really want our product to reach. We need to have people try the whisky. It’s great that we are now becoming more collectible but we make whisky to be drunk. I don’t want to be the distillery where our whisky is just put in a cupboard. So if you want to collect our whisky then buy one to drink also and have the best of both worlds. Kilchoman were the first Islay Distillery to be built on Islay for 124 years when you started building in 2005, were there any problems that came along with being the “new” Islay distillery, was it difficult to establish yourselves among the well-established distilleries already on Islay? Initially I think they thought I was a mad English man coming to Islay to build a distillery and it would fall flat on its face. Once they knew I was serious the other distilleries helped and supported us massively. Do you have any advice for Gartbrek Distillery? Is it exciting to see another distillery built on Islay? It’s very exciting and it’s good, and I hope that it all goes well for them and goes through. Jean Donnay has been coming over to Islay for years and the site is fantastic, I really hope it works out for them. My main advice for anyone is if you think you need £5M, you need £10M, there will always be costs you haven’t counted for. Starting a distillery is hard, although it’s far easier to start up now and find information out as there are more people to ask. whereas when I made the decision to set up there wasn’t a knowledge bank out there. Can you sum up Kilchoman for someone that has never tried any of the expression before? It’s a typical Islay malt, you will pick that up in its distinctive character but in a softer, sweeter, less aggressive way. So many non-whisky drinkers come and try it and then change their minds and it’s a pleasant surprise. What is your personal favourite Kilchoman expression? That’s impossible, there isn’t one true favourite, there have been a couple of single casks that for me were exceptional and I will always go for a single cask and not over sherried, we’ve released a few decent bourbon maturations too. 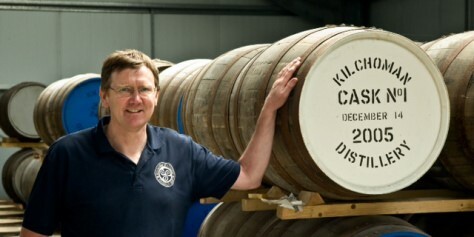 What next for Kilchoman? What ideas are there for future bottlings? The European tour will really build brand awareness, it was James and Peter’s idea and this has been really well received with our distributors and with the customers that are over there. It’s a chance to take Islay to the people that haven’t come to Islay. We also have a special release to accompany this that is limited to only 1500 bottles. We have an original cask strength general release coming out in October, this will be limited to around 8,000 or 10,000 bottles and it’s bourbon matured. Machir Bay will continue to evolve and we will always have a Loch Gorm. 100% Islay is a yearly release, although it only makes up about 15-20% of production but is our whole concept. It’s our own barley, malted on site, and lets us show the world that we can do this all at the distillery and it’s very important part of our heritage. It is sensible to keep it at a smaller level so we can manage the production of it all. I think five or six ranges at any one time is more than enough for us. and single cask releases are very important to us and always will be. Kirsty is co-owner of Whisky Corner, and has written for various drinks publications as well as for whisky.corner.co.uk. Follow Kirsty on twitter @KirstyClarke29 and @WhiskyCorner, you can also find Whisky Corner on Facebook and Instagram.